Some floors deserve a special mention! 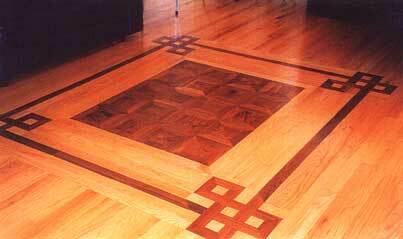 Featured in a home in the Highlands is a 1'' by 2'' Satin Finished Red Oak Floor with a Burl Walnut Monticello Inlay. The Meridian Corners come together with a Walnut Band. After the newly finished floors are cured according to the manufacturer's recommendations, rugs may be considered. It is advisable that a pad be used under the rugs to prevent slipping. It is not recommended that rug pads be made of PVC, solid rubber, or stiff pads with hard cleats or grippers. These can trap moisture and/or scratch the finish. The most often recommended pad is a rubber honeycomb type which has holes in it, allowing the finish and floor to breathe. The proper use of rugs can enhance the enjoyment of beautiful wood floors. Featured in a newly renovated home in Eminence, Ky., is a Natural Pine Hallway and landing with a Royal Mahogany staircase. 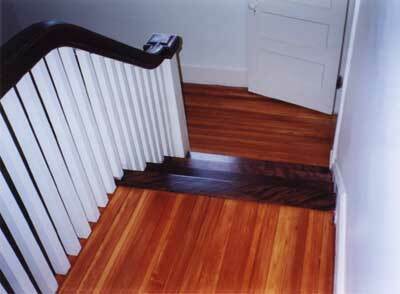 The stairs, landing and hallway were sanded and refinished to their natural beauty. With April showers, one needs to check for moisture before flooring can be installed or sanded and refinished. All excessive building moisture must be eliminated. Ensuring that moisture conditions are met means that the building must be roofed, walled, and guttered. All wet trades should be completed and the windows and exterior doors installed. The heating and air conditioning units should be operating. Ideally, a flooring contractor should proceed only after the interior atmosphere conditions of the building are established for a "normal" living condition. #1 Common White Oak flooring with a light oak stain. 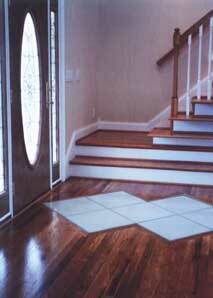 A tile inlay accents the foyer entrance and highlights the staircase to the upper level. For the ultimate blend of beauty, combine a stone medallion with the wood flooring in your foyer, kitchen, hallway or great room. We can now add stone medallions to any 3/4" unfinished or prefinished wood floors. There are six designs from which to choose and they are available in 25' and 36' sizes. These medallions are designed using a strong quartz material that is stain, scratch and slip resistant. What a beautiful way to make your wood floor truly unique! 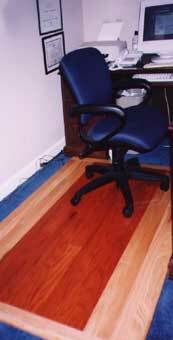 A custom-made wood floor protector is a nice distinctive alternative to the clear plastic mats. The beveled edges make an easy transition to your floor surface. Custom made of prefinished and stained natural topaz. Can be made according to your specifications.